Welcome to my web site where you will find a wide and ever growing selection of quality reproduction head-dress, uniforms, insignia, medals, awards and badges needed to complete your impression or display of the WW2 German soldier, the uniformed Police and political organisations in Germany between 1914 – 1945. The core of my range is produced in Germany by Michael Janke, who is renowned for his quality & accuracy of style. In the production of his Schirmmütze, Michael uses all natural materials & cotton threads. Japanned vulcan fibre peaks. Celluloid sweat diamonds & leather sweat bands. Aged, they are sometimes hard to distinguish from the original period caps & uniforms. I am confident in saying that they are the best available in todays market place & that you will not be disappointed with the quality of his superb caps & uniforms. All Insignia, badges, medals etc., are in my stock for immediate delivery, unless stated otherwise. Attention:- My 'Michael Janke' range is too vast & varied to hold items in stock, therefore caps & uniform items are hand made when ordered from stock, style & size patterns & they can take up to 12 weeks for completion. Note that it does not take 12 weeks work to make your order, but caps and uniform items are made in rotation of date received by a professional tailor & hat maker, using original machines and methods. Therefore, depending on how full Michael Jankes’ order book is, they may be completed sooner. 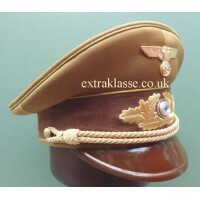 Michael Janke caps and uniforms are World famous and the very best reproductions available and well worth waiting for, but - Please do not order if you are not prepared to wait. We value all of our customers & do our utmost to complete orders as quickly as possible. Chasing me for news, ETA or updates will not make it happen any sooner & I always email customers to advise that their order is complete & has been posted to them. So many uniforms & so little time! 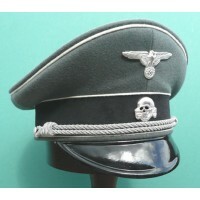 Allgemeine-SS Officer Peaked Cap. 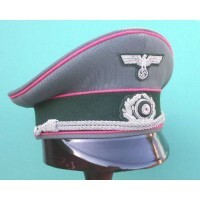 Black tricot top with white piping, aluminium buttons & cap co..
Army Panzer Officers Schirmmutze with tricot top, pink piping & bottle green band. 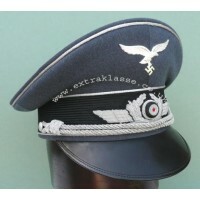 Complete..
Luftwaffe Officers Peaked Cap with tricot top, correct LW ribbed cap band & distinctive distress..
Waffen-SS Infantry Officers Peak Cap. 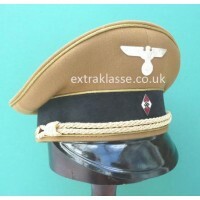 'Doe skin' top with white piping, aluminium cap cord & but..
Hitler Youth Leaders Peaked Cap, for the ranks of Gebietsfuhrer to Stabsfuhrer & also Reichsjuge.. 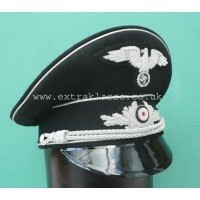 Diplomatic Official Lower Grades Career Peaked Cap with black 'doeskin' top & silver piping. 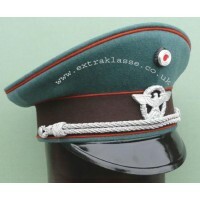 Cel..
Police green top with Gendarmerie orange piping, brown band, aluminium cap cord & buttons, black..
N.S.D.A.P. 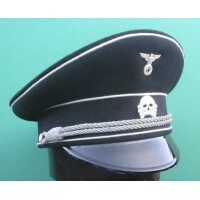 Leaders peaked cap. Model 1939 with fine quality tricot top. Celluloid sweat diamond, lea..